The Lowndes Vikings (5-3) hail from Valdosta, GA, a four hour drive from Denmark High School, where this Friday’s Final Four matchup will be played. The Vikings enter this game with a 10-3 record and come in on a hot streak after being winners of four out of their last five games. 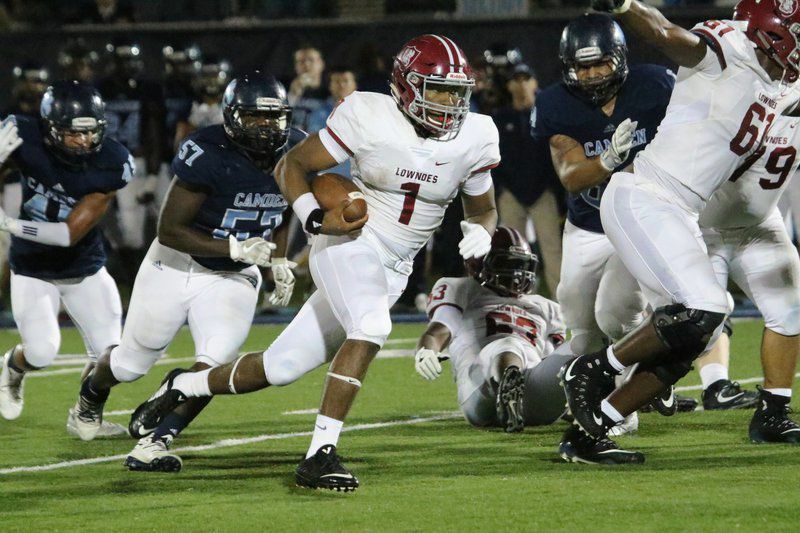 The Lowndes offense runs a version of the triple option, which is a scheme that emphasizes the running game. The Vikings will run the ball roughly 90% of the time, with the option of a QB or three different running backs receiving the ball. Therefore, the Vikings average a whopping 261.7 rushing yards per game, as opposed to 102.1 passing. Senior running back Travis Tisdale is the star of the show, as he leads the team with over 1,700 yards on the ground, which includes a 414 yard-outing against Valdosta earlier in the season. Tisdale is 9th in the state in overall rushing yards and a 4-star recruit who is committed to play for Kentucky. Freshman quarterback Jacurri Brown is second on the team with 654 yards on the ground, as the 6″3, 172 lb. newcomer has really emerged as a threat. However, he is mainly used as a running threat within this offense, and may come off the field on plays where the Vikings need to throw the ball. Although they tend to rely on their rushing attack first, Lowndes does have another quarterback who can come in and be an effective passer. Junior QB Andrew Koenemann averages roughly 100 yards per game through the air and keeps defenses honest when he comes in during obvious passing downs. Wide receivers Ghettis Brown and Ty’Ehir Simms lead the team with over 700 combined receiving yards and 59 catches. The Vikings’ defense has allowed more than 20 points four times this season, and their pass defense is a major reason for that. As a whole, the Lowndes defense has 13 interceptions this season. The defense is led by outside linebacker Tiberius Drocea, who leads the team in both INTs (3) and tackles (74). Defensive end Gary Osby has been a menace up front with 14.5 tackles for loss, 69 total tackles and 2 interceptions this season. 6″3 sophomore Jacques Hunter leads this team in sacks with 5.0, and the team as a whole has 16 sacks this season. Lowndes opened the season by blowing out Drew and Chamblee before losing a close game to Parkview. The Vikings then went on to rattle off four straight wins until they were barely edged out by Tift. Two weeks later, Lowndes lost to Colquitt County, a fellow Final Four team this season, 40-6. The Vikings are coming off of an incredibly impressive win last Friday over traditional powerhouse Grayson, 20-15. The Vikings are battle-tested, as they play in one of the state’s toughest regions that includes Tift County, Colquitt County, and Camden County.